Dr. Schoenbart and the doctors of Schoenbart Vision Care, in Garden City, NY are proud to introduce the latest cutting edge technology in retinal imaging, the OPTOS Optomap. This amazing device allows your eye doctor to see retinal, optic nerve and cornea structures not visible through regular exam methods by using light to provide a high-resolution scan meant to pick up early signs of structural change or disease. This allows our eye doctors to see even the smallest changes in the retina and optic nerve with greater accuracy, and much higher definition, making early and accurate detection of common sight-threatening eye conditions such as glaucoma, macular degeneration, and diabetic retinopathy, easier than ever before. 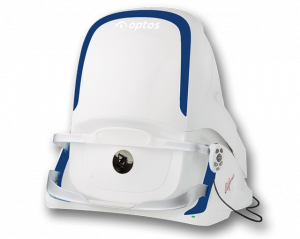 While traditional imaging technologies are usually able to scan around 15% of your retina at a time, The OPTOS Optomap is able to scan in a stunningly large 200 degree arc, capturing about 80% of your retina in one panoramic scan. This allows for a wider and more accurate view of the retina than with less advanced scans. This scan will provide you and your eye doctor with an extremely detailed picture of your eye that will act as a valuable road map of your overall eye health. The high-resolution images produced by the Optos Optomap provide a personal benchmark for each person's ocular health and helps detect sudden changes through the years, and since the images show up automatically on a computer monitor, you are able to see for yourself everything the doctor is telling you about your eye health, allowing you to take an active role in preserving your valuable sense of sight. The patient experience is also fast, easy and painless, with a noticeable focus on maximizing patient convenience and eliminating patient discomfort. Nothing touches your eye at any time and it is suitable for the whole family, from youngest to oldest. The exam consists of taking a brief look into the device one eye at a time. You will see a comfortable flash of light, which lets you know the image of your retina has been taken, and you're done! For more information, contact our eye doctors today.